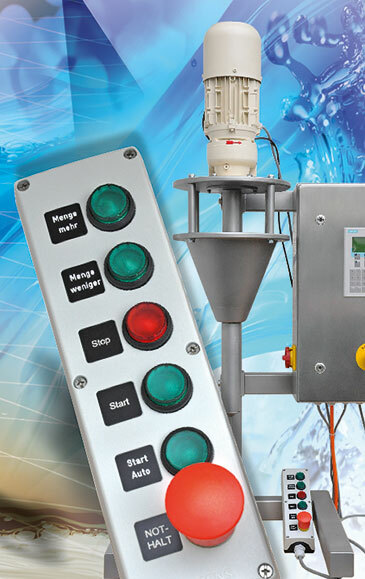 manual feed of the bottles, cups or cans. 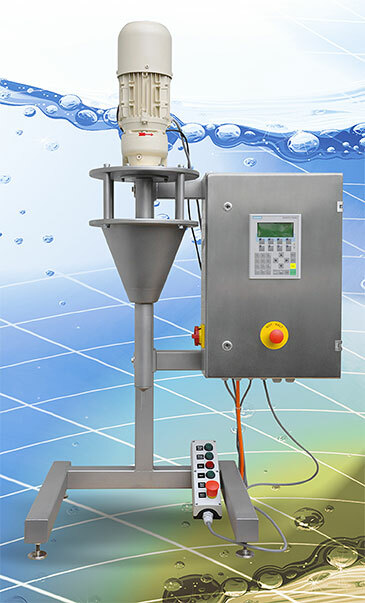 Another plant with a funnel-shaped storage container for filling in bottles, cups or cans also bases upon the principle of eccentric screw pumps. At the customer‘s application thin to viscous media should be bottled by pressing a button and on a gram exactly in manually supplied container, so that in view of the EU pre-packaging directive repeatable dosing had to be absolutely sure. The heart of the system is a vertical eccentric with a funnel-shaped storage container. With each revolution of the rotor, a defined volume is delivered so that the filling quantity is determined by the number of revolutions. The dosing control Jessfüll-01 consists essentially of a memory programmable controller (PLC), an LCD display for parameter input and the power unit for driving the pump. 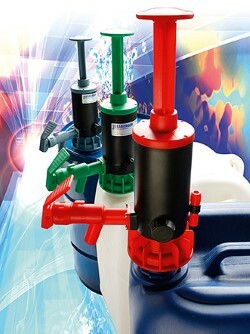 The dosing control can be used for the control of different pump sizes, whereby a further portion of the filling quantity is also possible. To start the filling process initially a trial issue is to calibrate. This is done by entering the nominal capacity and the determined actual amount of the sample output. Then the continuous filling can begin. 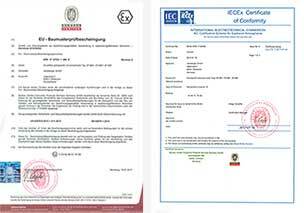 Occasional checks to deviations of capacity from the nominal value are required. Any discrepancies can be corrected manually at the control box. The bottling plant was completely made ​​of stainless steel 316Ti and is thus suitable for many industries and applications. The bottling plant can be used both in stand-alone mode as well as be involved operated in a master control unit and allows in this particular case of the customer a valveless, subsequent dripping free filling of different media in bottles, cups or cans. In addition to the user-friendly design (easy disassembly, fast product change) particular attention was paid to a high dosing accuracy, a gentle product handling and a pulsation free bottling. In addition to an FDA compliant version, also CIP cleaning can be offered as an option. Due to the requirements set out in the EU pre-packaging directive aspects can be considered from a legal perspective, that the bottle plant based on the principle of eccentric screw pumps by JESSBERGER with probability bordering on certainty takes these requirements into account and the filled volumes consequently always be within the permissible tolerance range. Gradual increase of the dosage by tapping. Gradual decrease of the dosage by tapping. The dosage is stopped in automatic mode. Only one filling capacity is dispensed. The continuous filling operation is started. There the system is stopped at every stage of the process.